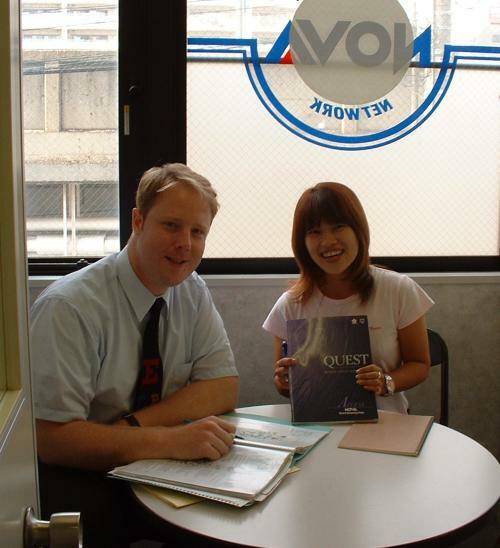 Time for a quick tour of the Tarumi branch of Nova, where Japanese students take English lessons from native speakers. I worked there from November 2001 to August 2002. 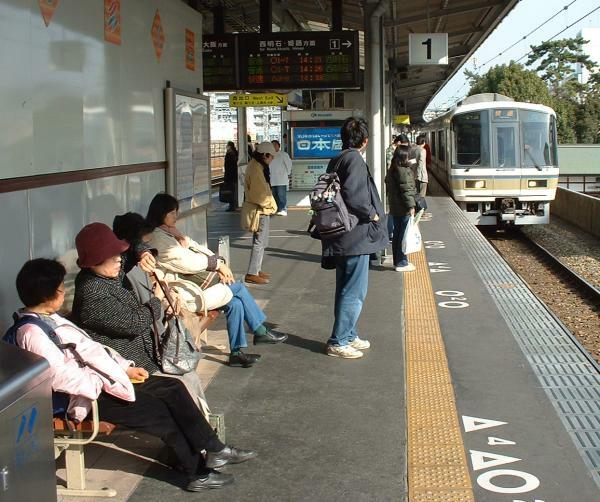 Let's start at the Tarumi train station. 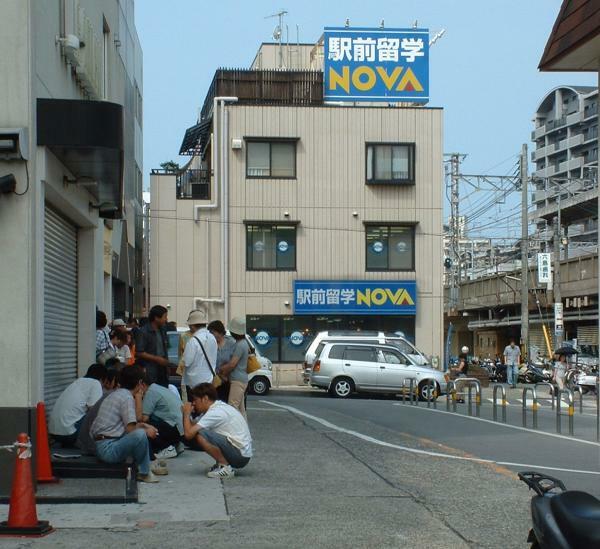 Most Nova schools are located just a block or two from the nearest station for the convenience of customers. The Nova slogan, after all, is "Study abroad at the station." Here's a look at the outside of the building. It's sandwiched between the Tarumi railroad station (right) and a pachinko parlor. This shot was taken early in the morning on Sunday, and just like every Sunday morning, a long line has formed of pachinko addicts waiting to get their fix. ...and if you're a student who has already purchased a block of lessons, you can give the staff your I.D. card and go upstairs to your classroom. Because Tarumi isn't a large school, lessons often have only one or two students, but on evenings and weekends, there can be up to three. Teaching all of them at the same time can be quite a struggle, and it looks like Sam's got his hands full here. Then again, maybe he just had some bad sake last night. Lessons last 40 minutes each in the morning and evening, and 45 minutes in the afternoon. Like all full-time Nova teachers, I taught eight of these lessons a day, five days a week. That means I taught more than 1,400 lessons in my nine months at Nova! The repetition got boring at times, but somehow my students seemed genki no matter how mundane my lessons were. That's me on the left, but I guess that's obvious. Nova offers a rather unique supplement to the classroom: the "Voice Room". This is simply a room full of couches and padded chairs where students can talk freely in English about anything they want. It's a more relaxing and natural setting than the classroom, and it lets the students get to know each other (and the teacher) a little better. In this picture, only two students showed up for Voice, but on the weekends, the room was often packed with students. Students can book lessons any day of the week, any time of day from 10 AM to 9 PM. 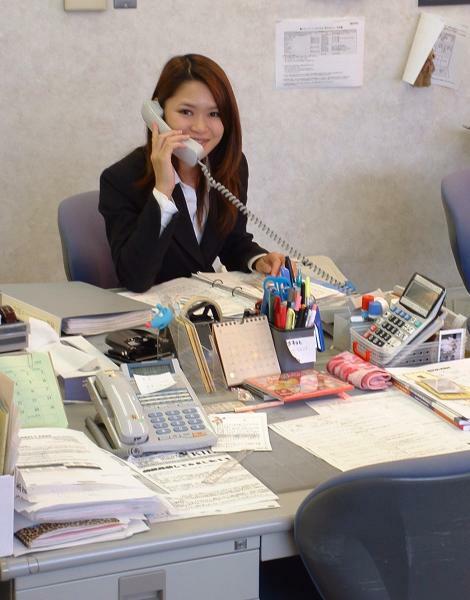 They usually call a few days ahead of time and speak to one of the Nova staff, such as Noriko here, to reserve a time slot. Nova is not a public school; it's a corporation publicly traded on the JASDAQ stock exchange (code 4655). This focus on profit means that a lot of time and effort goes into promoting, marketing, and selling English lessons. 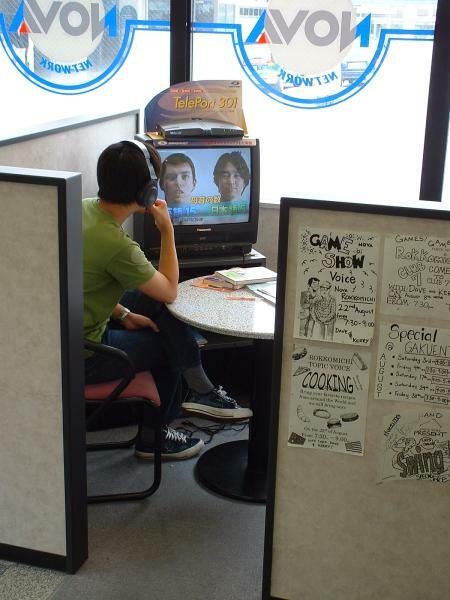 Here, a potential customer watches a Nova publicity video and will soon get a sales pitch from a staff member. Now let's go behind the scenes to the teachers' room. This is where we planned lessons, ate lunch, and gossiped. In this picture, Heather (from America) is planning a lesson for one of her kids classes. 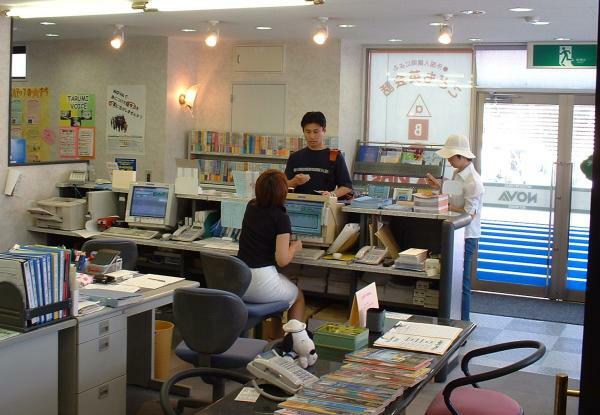 Nova has hundreds of branches throughout Japan, and when a teacher goes on vacation or gets sick, another one takes up the slack by working overtime. The branch with the vacancy faxes a request to all the nearby schools, and those schools post the request in the teachers' room. 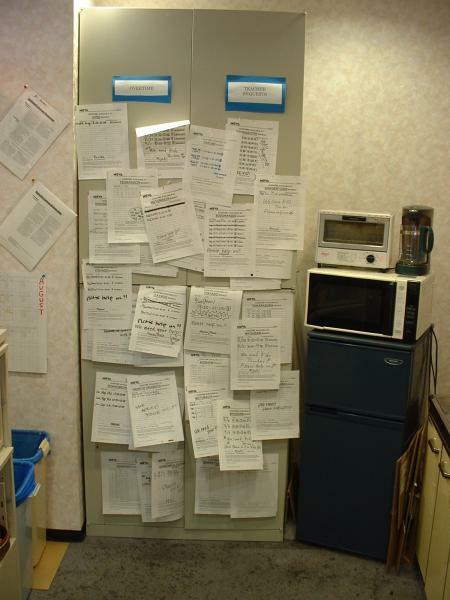 On one particular month, when teachers seemed to be going on vacation, quitting, and getting sick all at the same time, the overtime requests came in so fast that there was no more space to put them. 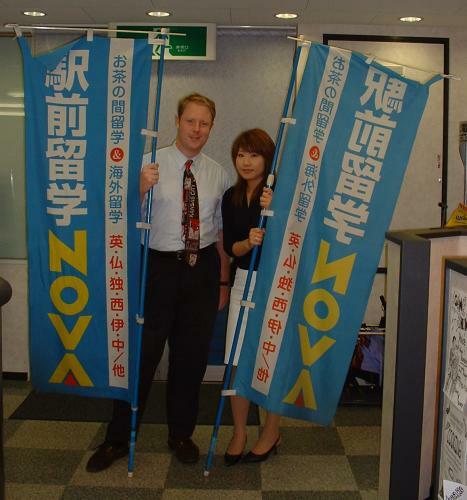 Kozue, a staff member, posed with me for a picture on my last day at Nova.